StageTek® decks not included and should be ordered in addition. 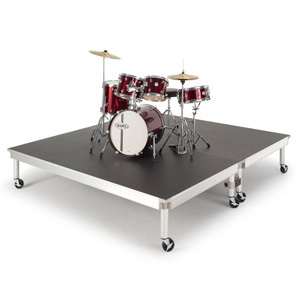 StageTek® platforms can be transformed into highly mobile rolling platforms with a simple kit consisting of 4 legs with locking casters and a connection bracket. With this kit your StageTek decks become the perfect drum riser or elevated production platform. Available in heights from 12-1/4" to 24" (31 to 61 cm) in 1" (2.5 cm) increments. Guardrails are recommended for elevations over 16" (40 cm). 280A550 Each kit contains four legs and one connection bracket. Roll-a-Deck Kit includes 4 legs with locking casters and connection bracket. Kit does not include StageTek Platform. Must be purchased separately.